The Library has recently accepted a deposited collection of early children’s books from the Lewis Family Trust, which includes five harlequinades. 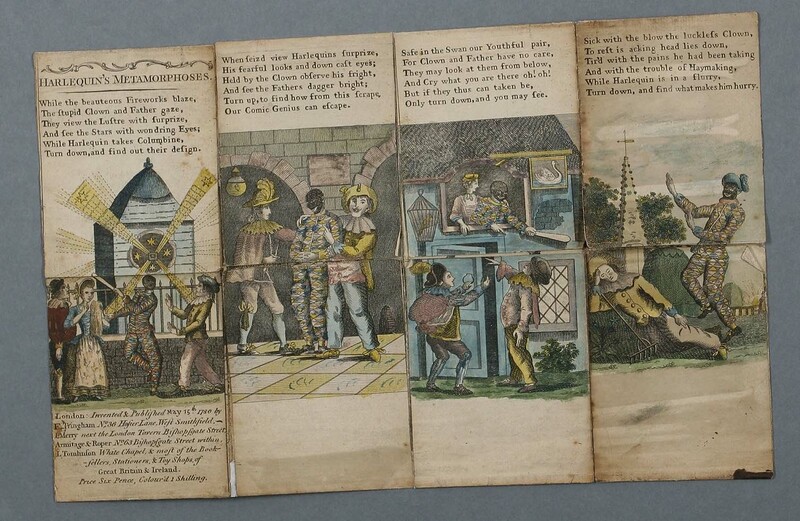 A harlequinade (known also as a metamorphosis, flap-book or turn-up book) is composed of two single engraved sheets. The first sheet is folded perpendicularly into four sections. A second sheet is cut in half and hinged at the top and bottom edges of the first so that each flap could be lifted separately. The sheets are folded into four, like an accordion, and then roughly stitched with a paper cover. A verse on each section of the flap tells a simple story usually concluding with instructions to turn a flap to continue. When the flap is turned either up or down the viewer sees that half of the new picture fits onto the half of the un-raised flap, so the act of lifting one flap after another creates a surprise unfolding of the story. Click to see a harlequinade in action harlequinade-movie. They were devised by the publisher Robert Sayer and were popular from about 1765 until the beginning of the 19th Century, although manuscript copies telling biblical stories survive from the late 17th Century. The printed copies often have Harlequin as the central character, hence harlequinade, and were sometimes published to accompany a current performance on the London stage.